Escape From the Pipe Men! by Mary G. Thompson. Review: Imagine a world where kids are on display at a museum É as a human exhibit! That is the case for Ryan and Becky. But when their father who works with aliens develops a serious, rare disease, will they be able to find the antidote and save their dad? Find out the answer and so much more in the falling-off-the-edge-of-your-seat book, Escape From The Pipe Men by author Mary G. Thompson. If you want to find out what happens read this book review. Ryan and Becky have always been human but their dad works with aliens. Although it seems fascinating, they find out that being an alien zookeeper isn't all fun and games. What they do find out is that being an alien zookeeper can be as hard at times, but can't be as hard as this time. When a dangerous rare alien pokes Ryan and Becky's dad, will they be able to trace where he came from and find its leader? Throughout the novel, they meet a lot of aliens that give Ryan and Becky help. For example they are given this anxious calculator from a one-of-a-kind species that can open any portal to any planet, any time. But there's a catch. Will they be able to save their dad and travel the galaxy without facing to many problems? 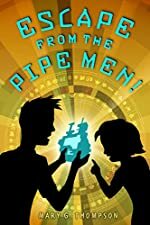 What I like about Escape From The Pipe Men is that Mary G. Thompson has the book action packed with problems, cool characters, awesome new places and so much more. I also liked how Thompson is so imaginative in creating characters like Ol-tub-ila, a big purple blob with I think one eye. She creates a good visual image of the pipe men too, which are these long characters that have tons of eyes. Would you want one of those by you? I personally liked all the events that happen such as how Ryan and Becky get to fly in an amazing spaceship. It is also clever how any portals can take you thousands of miles away. At some points, Thompson's writing is not as action packed as others, but that is okay. Something that makes the book stand out from others is the setting because it takes place on a whole different planet. It is said in the book that the planet sticks out from others because there is a gigantic spaceship station with rare supplies. Moreover I also like the writing style Thompson uses because she cleverly adds unexpected surprises. The creative characters are the most impressive though. So if you want to find out if Ryan and Becky can save their dad Escape From The Pipe Men is perfect for science fiction reader and adventure readers. We would like to thank Houghton Mifflin for providing a copy of Escape From the Pipe Men! for this review. Have you read Escape From the Pipe Men!? How would you rate it?